Summer may officially begin at the solstice, but in the church world, you know it’s summer when flyers for Vacation Bible School start popping up everywhere. A quick survey of churches across the country reveal much of the same curriculum utilized from Group, Lifeway, or Standard publishing houses. Creative, intricate props and stage design transform church sanctuaries, hallways, gymnasiums, and fellowship halls into caves, mountain-top panoramas, and underwater adventure parks. Like many Church of God congregations, Adamsville Road Church of God in Elkhart, Indiana, has been there, done that. There’s nothing wrong with that, either. But they began exploring the possibility of doing something a little different this year. As a reflection of a community-oriented outreach strategy for the summer, Adamsville Road Church of God opted to take VBS on the road. Instead of telling the community to come to VBS, they took a modified VBS-like experience to the community. North Lake Apartments are situated not far from the church, but just far enough away that if children didn’t have parents or a bus to transport them, they probably wouldn’t make it to VBS. So on a Sunday afternoon in June, volunteers from the church loaded up their vehicles with games, snacks, and supplies to bless the children and their parents with an afternoon of family fun. True, the church didn’t have home-court advantage; they were in largely unfamiliar territory and didn’t have every resource at their fingertips. But what they had was far better. Photo: Adamsville Road’s offsite ministry of presence. The team went in, set up in a visible location by the swimming pool, and spent time with the children. They played corn hole. They enjoyed a variety of bubbles and bubble-making equipment. They brought along freezer pops. Time passes quickly, but the impressions they make are lasting. Especially because the church will return and do this again at the same apartment complex once in July and finally in August. 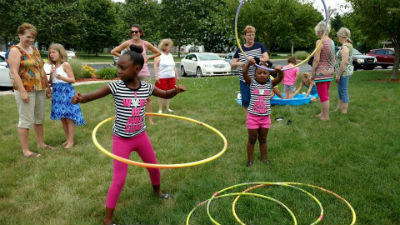 Senior pastor Mike Stadelmayer and Denny Olsen have also led Adamsville Road Church of God to active involvement in the local elementary school and recently hosted a picnic for their neighbors. This Elkhart congregation is continually looking for new ways to be a part of the community, not just a fixture in it. This entry was posted in All Church of God, Great Lakes and tagged Adamsville Road Church of God, apartment, community, Denny Olsen, Elkhart, Indiana, Mike Stadelmayer, outreach, presence, Vacation Bible School, VBS. Bookmark the permalink.